The Carnival Corporation is launching 4 new cruise ships in 2019 across three different cruise lines including Carnival Cruise Line, Costa Cruises and Princess Cruises. It’s going to be a busy year of ship deliveries and news! 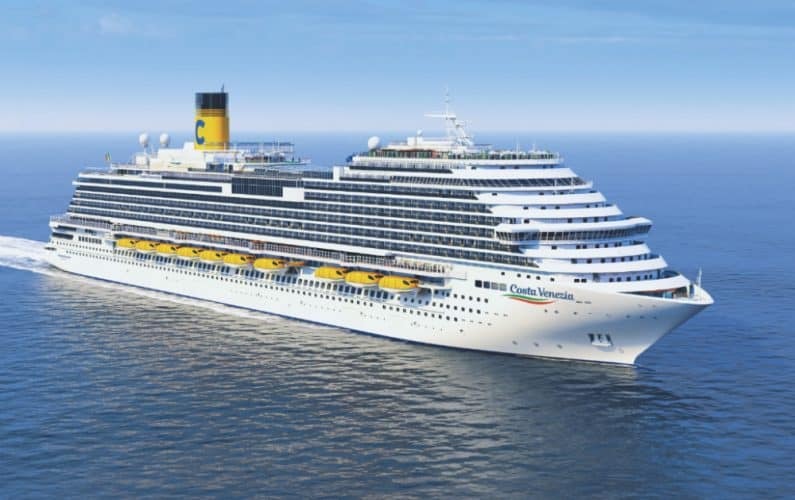 For Costa – the first international cruise brand to serve the China market with a homeported ship in 2006 – everything about Costa Venezia is designed with the Chinese consumers’ preference in mind. 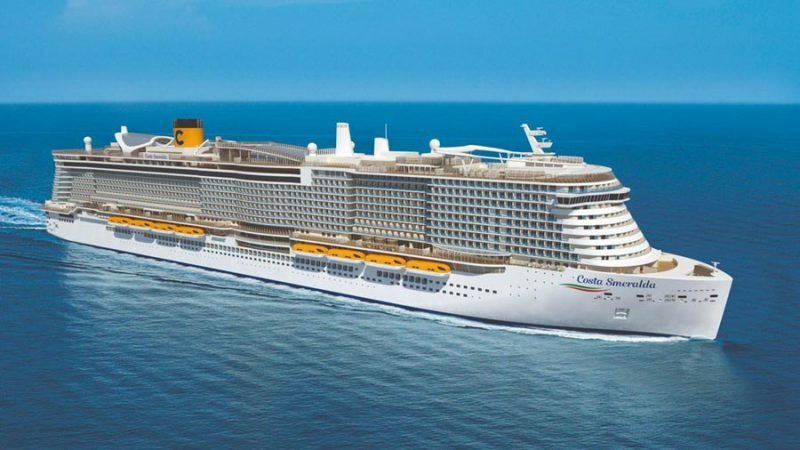 The 135,500-ton, 5,260-passenger Costa Venezia will be Costa Cruises’ largest ship operating homeport cruises from China and will be dedicated to Chinese guests beginning May 2019, offering them an Italian twist on cruise itineraries throughout East Asia. European and North American guests will be welcomed onboard for the scheduled March 3, 2019, vernissage cruise from Trieste, Italy, to Greece and Croatia, followed on March 8 by a 53-day inaugural cruise, with Costa Venezia setting sail along the route once explored by Marco Polo, making its way through the Mediterranean, the Middle East, Southeast, and East Asia before arriving in Shanghai. Sky Princess will carry 3,660 guests and include the best of the stunning features found on its three Royal-class sister ships – Royal Princess, Regal Princess and Majestic Princess – as well as new offerings that represent an evolution of the current ships’ designs, with new innovations designed to exceed guests’ expectations. 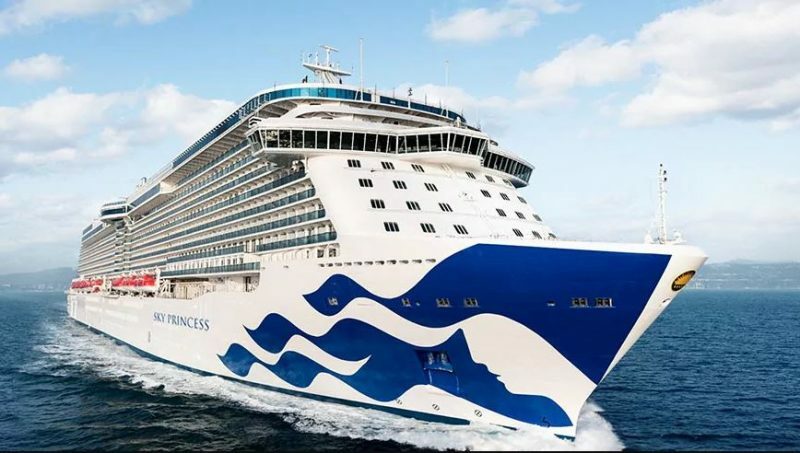 The inaugural Mediterranean deployment of Sky Princess is set to feature 10 cruise departures on eight unique itineraries, beginning October 20, 2019, with a seven-day Mediterranean and Adriatic cruise from Athens (Piraeus) to Barcelona. On November 17, the ship is scheduled to set sail from Barcelona for Fort Lauderdale, where guests will enjoy tropical holidays in the Caribbean before the ship returns to tour Europe beginning in April 2020. With a name that honors the spectacular Emerald Coast of Sardinia, the stunning features of Costa Smeralda will reflect the best of Italy, delighting guests with a unique travel experience evoking the style, hospitality, and warmth of the “bel paese” (the beautiful country). The ship will be Costa Cruises’ first that is able to be powered in port and at sea by LNG, the world’s cleanest burning fossil fuel. Costa Smeralda guests will have access to 11 restaurants, four swimming pools, a water park with colorful waterslides, a multi-sport gym, disco, jazz club, games room, special areas set aside for kids and a luxurious spa featuring a beauty salon, hammam, thalassotherapy pool, 16 treatment rooms, and snow, salt and relaxation rooms. 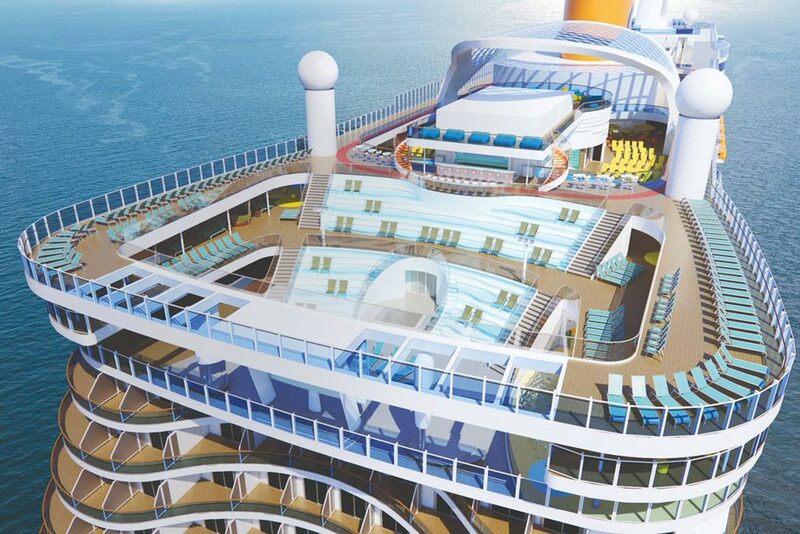 At 182,700 tons, and with over 2,600 guest rooms, Costa Smeralda will be the largest ship in Costa Cruises’ fleet. The ship is scheduled to make its maiden voyage on October 20, 2019, with a 15-day cruise from Hamburg, with stops in Rotterdam, Lisbon, Barcelona, and Marseille before arriving for a dazzling naming celebration at Savona, in northwest Italy, on November 3. When the new Carnival Panorama arrives in Long Beach next December, it will become the brand’s first new ship to homeport in California in 20 years, sailing year-round voyages from the newly renovated Long Beach Cruise Terminal to the Mexican Riviera. 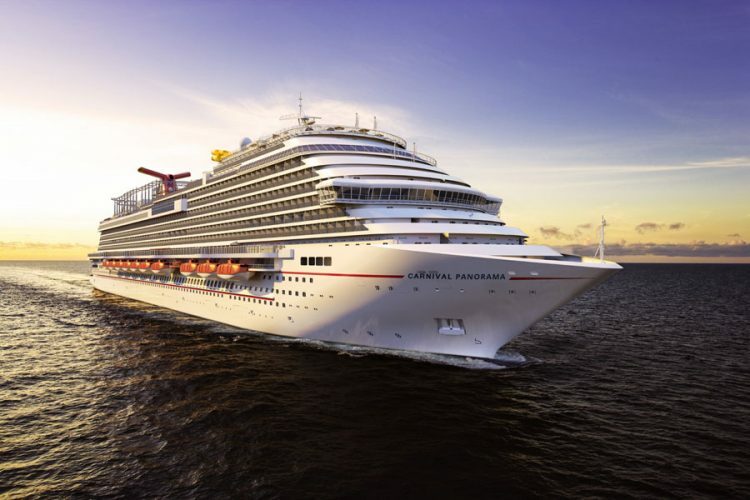 The 4,008-passenger, 133,500-ton Carnival Panorama is the third in the line’s highly successful Vista-class series, the largest ever constructed for Carnival Cruise Line, which includes Carnival Vista and Carnival Horizon. The three ships are all named to reflect the connection between the vessels and the sea. Carnival Panorama will feature a wide variety of fun indoor and outdoor experiences for a unique seagoing vacation, including popular features such as the tropics-inspired Havana section, Family Harbor with extra-roomy staterooms and the Family Harbor Lounge, a massive WaterWorks aqua park, the luxurious Cloud 9 Spa and the SportSquare recreation area. Carnival Panorama is scheduled to debut on December 11, 2019, with a special three-day inaugural cruise from the Long Beach Cruise Terminal, which is housed in a massive 146,000-square-foot geodesic dome that once served as home to Howard Hughes’ Spruce Goose airplane. Most California residents and the surrounding area live within a day’s drive of the port. Year-round, seven-day Mexican Riviera cruises begin December 14, departing Long Beach every Saturday to stunning destinations along the Mexican Riviera, including Cabo San Lucas, Mazatlán and Puerto Vallarta.